National Geographic mentions that the winners in the 2008 International Science and Engineering Visualization Challenge have been announced and have some of the photos. My favorite is below the fold. Science Daily has an interesting article up about the evolution of echolocation in toothed whales. The research behind the article was published in Lethaia. After dodging Hurricane Katrina, researchers in the Deep Scope exepediton reports the discovery of a new species of squid pictured above. The ship’s crew took special precautions as they cruised from Texas back to the Viosca Knoll to avoid hurricane debris. They encountered extensive garbage, but nothing that threatened the ship. They also saw signs of damage on oil rigs and heard reports from other ships that all rigs within a 50-mile-wide swath beneath the hurricane’s path appeared to be thrashed beyond operable condition. 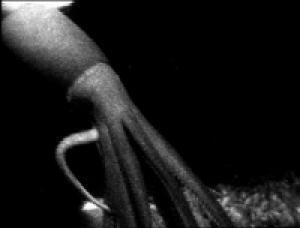 Last year, the system captured footage of a six-foot squid believed to be a new species. This year, at a site hundreds of miles away, the camera caught footage of what appears to be the same species, which would suggest that the squid is not rare, and would also illustrate how poorly explored the deep sea remains if such a large animal could have gone undiscovered. The squid appears to have been attracted by a flashing light lure designed to mimic a deep-sea jellyfish’s bioluminescent display. Much remains unknown about how animals use bioluminescence, and one of the key goals for Eye-in-the-Sea beyond basic observation is to use the bioluminescence lure and other techniques to learn how animals use the light they produce. Frank has been conducting detailed studies of how the eyes of animals on the deep seafloor work, in collaboration with others aboard. Working with animals collected in special light-tight devices that avoid damage to delicate deep-sea eyes, Frank has discovered a species of deep-sea crab that can detect ultra-violet light, despite there being no known ultraviolet light in deep water. 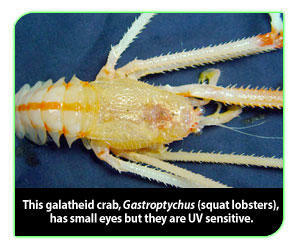 UV sensitivity is common in animals that live closer to the surface, but has never been discovered in a deep species. The reasons for this seemingly bizarre ability are not clear, but the sensitivity could point to a deep-sea light source about which researchers are not aware, or to some unknown characteristic of known light sources such as bioluminescence–the light chemically produced by countless open ocean organisms. More info on Deep Scope – includes more pictures and periodic dipatches.